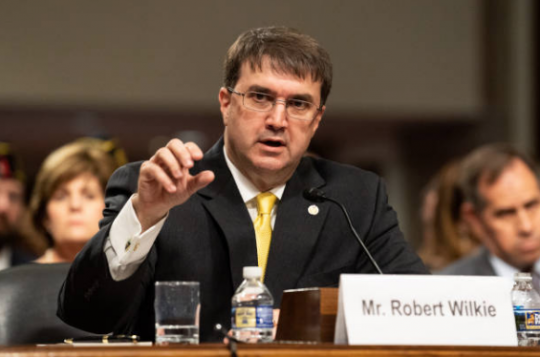 The Senate overwhelmingly confirmed the nomination of Robert Wilkie to be secretary of Veterans Affairs in an 86-9 vote on Monday. He earned the support of most Senate Democrats largely by promising not to privatize the VA, the Associated Press reports. Wilkie served as assistant secretary of defense under President George W. Bush and has served as acting VA secretary since the firing of David Shulkin in March. During his confirmation hearing, when pressed by Sen. Jon Tester (D., Mont.) if he would disagree with Trump, Wilkie said "yes." President Donald Trump reacted to Wilkie's confirmation in a statement and said, "I have no doubt that the Department of Veterans Affairs will continue to make strides in honoring and protecting the heroic men and women who have served our nation with distinction," he said. Democratic Sen. Maggie Hassan (N.H.) praised Wilkie in a statement and said she met with him personally. "In particular, I appreciated Mr. Wilkie's commitment to implementing the bipartisan VA Mission Act, as well as to addressing issues with the Veterans Choice program," she said. The "No" votes on Wilkie's confirmation included several names considered to be 2020 presidential contenders. Those nine Democratic senators are Cory Booker (N.J.), Dianne Feinstein (Calif.), Kirsten Gillibrand (N.Y.), Kamala Harris (Calif.), Ed Markey (Mass. ), Jeff Merkley (Ore.), Ron Wyden (Ore.), Elizabeth Warren (Mass. ), and independent Sen. Bernie Sanders (Vt.), who caucuses with the Democrats. Harris criticized Wilkie for "celebrating those who fought for an America that kept human beings enslaved, to his efforts to justify Trump's ban on transgender troops."